Caterpillars of a number of large moth species in the genus Wiseana are commonly called 'porina'. They're important pests of New Zealand pasture, but farmers aren't without a few natural allies. 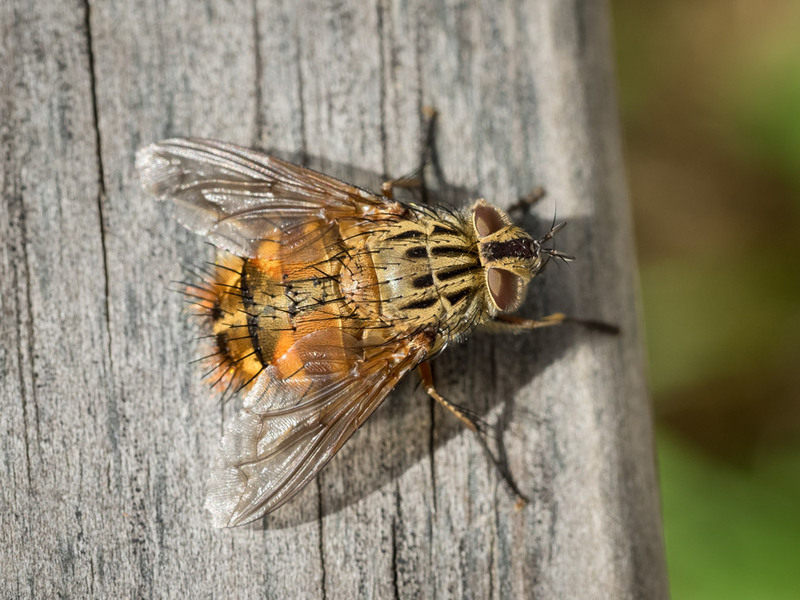 This is one: a big tachinid fly in the genus Protohystricia. Its larvae parastise porina caterpillars, but to the best of my knowledge, no one knows how they affect porina populations. My guess — and I stress it's a guess — is that parasitism by these flies has no discernible impact. Still, if you live in New Zealand and see one of these — don't swat it! How fascinating. And it is a beautiful thing, so it is nice to hear that it has a friend (or two). Another dear little friend to have around, especially with those gorgeous eyes. I am becoming quite serious about making this and your furry jumping spider into soft toys for little E.
Perhaps they'll be soft toys for P.P. rather than Little E.
Ok, I really don't see how you can see the beauty of this beast, and still be creeped out by beautiful spiders. Eye of the beholder, I guess, Zhoen. I admit my reaction to many spiders isn't logical, though. You are not alone. Apparently there are arachnophobic entomologists.